After photographing over 120 still life portraits and now installing them into Monthly Desk Calendars and Weekly Planners I came to the conclusion that I had never created a December winter still life that wasn't Christmasy. So I gave myself the assignment to create one before December 23rd when the holiday entertaining would occupy most of my time. What did I know about it? 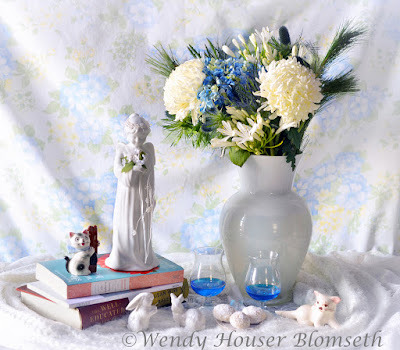 It had to have blues and whites, include a flower arrangement placed in a white vase and had to be a colorful self portrait that had a winter feel. Where to start? While Karl was shopping for the Ugly Christmas Sweaters for everyone at consignment shops I accompanied him through the door but ventured off to the ceramics shelves to see what I could find. I didn't know exactly what I was looking for but I intuitively knew that I'd know it when I found it. At the third store I found this beautiful white figurine of a young woman holding a bouquet of cascading flowers. I picked it up and wondered if she was "the one." I asked two of the sales associates if she could be a winter angel and they both agreed. Thus, she was "the one" and would be the main character in this still life. I envisioned a white ground cover that represented snow. When I found a large white infinity scarf at Target I thought it would serve two purposes: keep me warm when I wore it and create the illusion of snow cover in my still life. Things were coming together. When? You wouldn't think that the ability to leave early on a Friday afternoon because of a huge snowstorm approaching would be interpreted as the sign to drive directly to the local flower store and buy a blue and white flower arrangement. But it was. And I did. The bonus was purchasing white ceramic figurines of bunnies and birds. So now, it was really coming together in my mind and I knew I would start to work right after dinner. However, as my mother always said, "clean up one mess before you start another." My desk top where I would have to shoot was a total mess so the first hour was devoted to that task as well as taking down the art on the designated wall that needed to be blank. Once the wall was blank I had to choose a fabric backdrop from my current inventory. No time to go shop for a new one at 9:00 p.m. After testing a couple of fabrics I chose one and then had to iron it. Last steps between 11:00 -12:30 a.m. were to pull my newest books from the book shelf and find a colored liquor that worked with the cool palette. I did half a dozen test shots with various layouts and then called it a night. At this point I was tired. Tomorrow I would make the best of whatever light came through the east window. When will there be enough light on a very dark, cold December morning? That is a question for a gambling photographer who cannot predict when or if the sun is going to break through the clouds and how far south will be the angle of the sun if it does shine through. It may never brighten up the table top and all my beautiful objects d'art ready to be photographed. The answer is simply to photograph a variety of poses throughout the late morning and early afternoon and have some fun with it. In fact, I even drove over to the local antique store and hit the jackpot by finding a couple of additional ceramic figurines, birds, to add to the menagerie. That was a fun surprise. Time, as always was of the essence for two reasons, the sun was going to move west and be totally out of the picture, literally, and we were entertaining friends for dinner. I had some tasks that had to be completed so I couldn't play all day. Not to brag but the result was about half a dozen fun combinations of winter angel, floral, sweets (beverage and cookies) and ceramic figurines. All my new favorites. 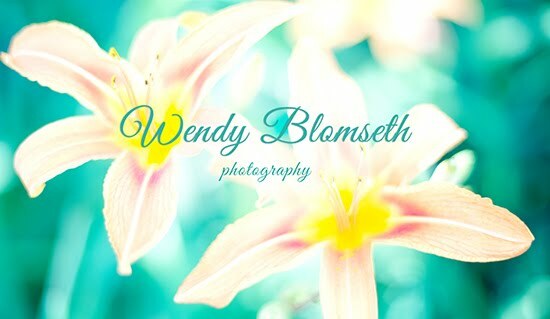 I chose this one to display here because it has the required elements of what encompasses my favorite still life portraits. So this with image I can say Happy Winter! Enjoy the cool colors and all that winter gifts to us.